Join Global Genes Project for their 2nd Annual “RARE Patient Advocacy Summit” to be held on Friday, September 20, 2013 at The Balboa Bay Club & Resort in Newport Beach, CA. Register today! Seating is limited for in-person participation. Webcast registration available for those unable to attend in person. Please join us for the second annual BIO Patient and Health Advocacy Summit on October 8-9, 2013 in Washington D.C. We are looking forward to another robust program that will explore timely policy issues and other topics important to the patient advocacy and voluntary health organization community. US Conference on Rare Diseases & Orphan Products: The New Era in Health Care, which will be held October 7-9 in North Bethesda, MD. This year, the third Annual Meeting of stakeholders in the rare disease/orphan product community comes at an opportune time. Two new laws – the Affordable Care Act (ACA) and the FDA Safety and Innovation Act (FDASIA) – are being implemented. Rare Disease Legislative Advocates is pleased to invite you to the 2nd Annual Rare Voice Awards Gala. A celebration to honor advocates who give rare disease patients a voice on Capitol Hill. 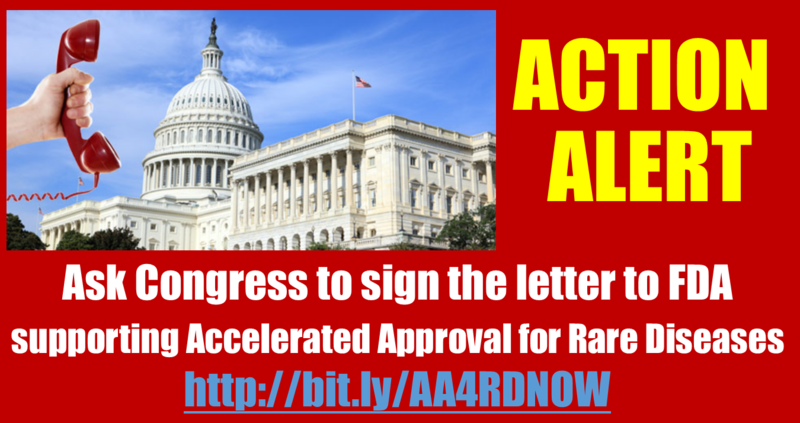 Accelerated Approval for Rare Diseases – Call Congress Today! Representative Bilirakis (R-FL) is circulating a letter in Congress calling on the FDA to fully implement FDASIA and give rare disease access to Accelerated Approval. URGENT ACTION is needed from the patient community to ask Members of Congress to sign onto the letter. Please CLICK HERE to call your Member of Congress. https://rareadvocates.org/wp-content/uploads/2013/07/Accelerated-Approval-Action-Alert.png 713 1350 Grant Kerber https://rareadvocates.org/wp-content/uploads/2016/05/rdla-blue.png Grant Kerber2013-07-25 13:14:512014-03-25 12:51:33Accelerated Approval for Rare Diseases - Call Congress Today! A Capitol Hill briefing, “Answering a Compelling Need: Expediting Life-Saving Treatments to Patients,” will be hosted by Friends of Cancer Research to educate members of Congress and other key stakeholders on the importance of all of the FDA’s regulatory and approval mechanisms, highlighting the breakthrough therapies designation. July 24, 11:30 a.m. -1:00 p.m. Dirksen Senate Office Building, Room 366, Washington, D.C.
Join the EveryLife Foundation for Rare Diseases for a conference call and webinar on the implementation of the ULTRA/FAST Legislation that was included in FDASIA to empower the FDA to give rare disease treatments access to the Accelerated Approval pathway. The FDA recently issued a draft guidance on the Expedited Approval Programs which they say fulfills the FDASIA mandate, however the guidance does not address issues specific for rare diseases as required by FDASIA. 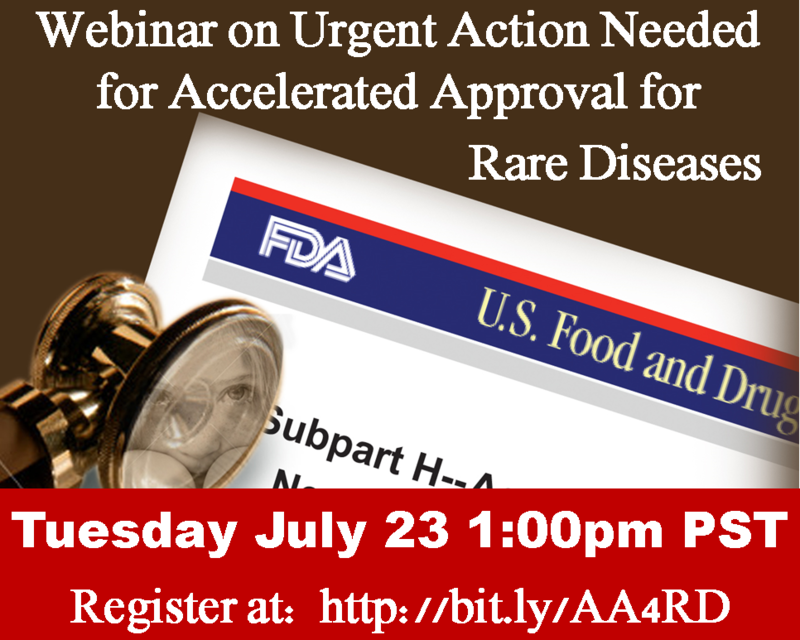 Please join the webinar to learn about the URGENT ACTION that is needed from the patient community to ensure rare diseases have access to the Accelerated Approval pathway. Who’s in charge of translating science into cures? When: June 25, 2013, 12:00 p.m. – 1:30 p.m.